I found the rubon yesterday at Michael's. It's hard to tell from the photo, but the rubon really glistens. 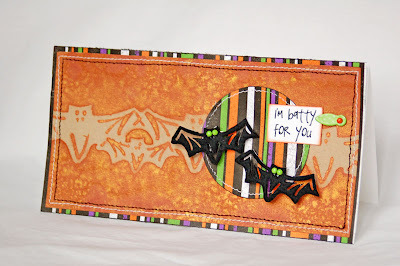 I paired it with some fun, glittery papers from K and Company and some Queen and Company bat felt. Thanks for stopping by. I'm off to check out the rest of the cards that people have made using this sketch. I got a chance to sit down yesterday, pull out all of my Webster's goodies and just play. I love these papers. They are so me! And the new trim is just wonderful, too! I did this first layout for Iris' challenge. There's still a few days to head over to Inspire Me and play. The details are HERE. Anyway, we had to say goodbye to our trusted car seat. Ryan was really sad to see it go. So, I thought I'd do a page about it. (He's really glad I did it. ;) ) I added a Creative Imaginations transparency to the focal pic and along the bottom of the other one. Here's the journaling: For 7 days a week, five years and 2 months, you carried my sweet boy. I always felt safe knowing that you were cradling him as we drove down the highways of life. All of the research I did before I selected you certainly paid off. Thank you for a job well done. Ryan is too big for you now. The booster seat has taken your place. But fear not, you will always be remembered. I also made a couple of cards. This first one uses a fun vintage image I got at Emma's. They are made by a company called B.Shackman and come in sheets. Lots of fun themes. I love how it went with the Webster's papers. This last one is a little mini card. I hand cut some flowers and added the Melissa Frances resin flourish and the trim. Finally, it's my day at the MMM Blog. 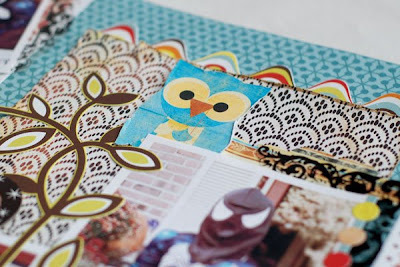 I posted some photos and ideas for journaling. Yuck. It's cold and rainy. And we're supposed to have a soccer game. I'm hoping things get canceled, because there is NOTHING worse than sitting outside on a cold, damp day. Anyway, here are a couple of projects to brighten things up. This first one was on the Queen and Company blog this week. I posted a tutorial on how to change the color of the white pearls to match a project. Here is the final product. I have it displayed in my dining room right now. I used lots of QCo felt and pearls on it. Fun stuff! Here is a card I made for Emma's this week. It's based on Cindy's sketch. I used some BG Urban Prairie. I just love the colors in this line!! Hope you're finding something fun to do this weekend! Here is another project I want to share with you. Cindy has put together a great kit at Emma's. 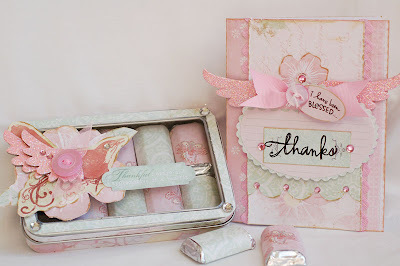 The National Breast Cancer Awareness October Kit is filled with Melissa Frances stickers papers and lots of great embellishments. $5 from the purchase of each kit will be donated to the National Breast Cancer Organization. 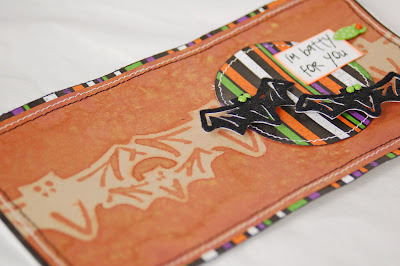 Each week, one DT member has created a project along with directions for the blog. 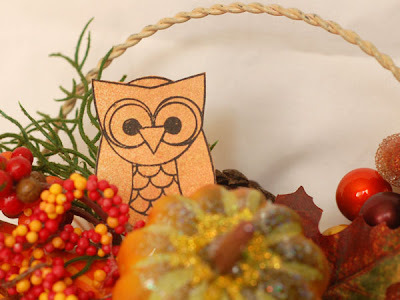 Jessica and Lisa's projects have been posted so far and they are super cute. 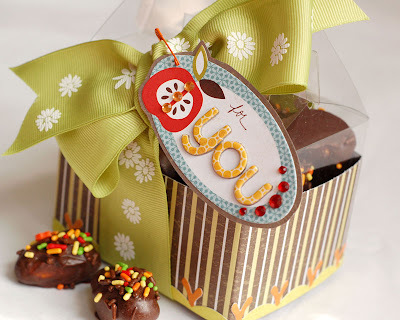 I created this little chocolate filled tin and card. Directions will be on the blog. 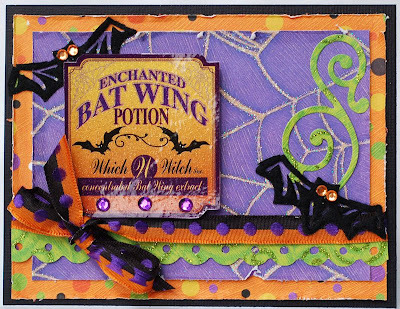 More information about this kit can be found here at Emma's Paperie. 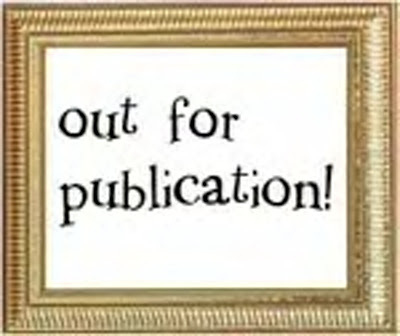 So, I have a couple of things to share today. Not a whole lot of new stuff. First up is my CPS card for the week. This next project was my Emma's project for the week. Our theme was 'homemade'. I found these fun sprinkles and knew I wanted to make chocolate covered pretzles. YUM! The clear gable box was perfect for them. Hope you have a wonderful weekend!!! 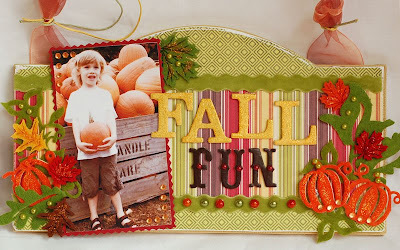 It's turning cool today, so I'm thinking we'll do some fun fall activities. Maybe the pumpkin patch! Where has time gone? I can't believe it's almost been a week since I posted! We spent last weekend in Virginia. It was a lot of fun! We spent a lot of time with my brother and took in several sights in DC. I got to meet an online friend for the first time, which was great! And I got to see another friend's new home. Needless to say, yesterday was a day of laundry and cleaning around the house. Going away is so much fun, but there's always the price to pay when you get home! Well, here is a project for today. Ryan was drawing some cute monsters this weekend, so I had him create some for me. I've made several projects using them and I love them! Here is a card that I made. I colred his drawing with colored pencils and mounted it on K and Company paper. Isn't this spider the cutest thing??? He's from K and Co., too. And the jewels are Queen and Company. I love that they are self adhesive. 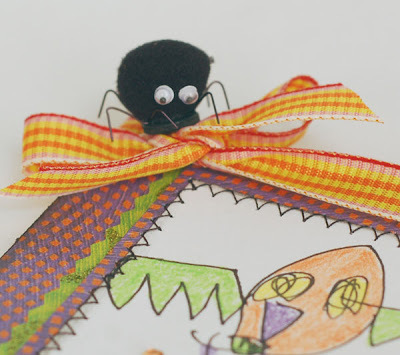 I created another couple of projects using these little handmade monsters for the MMM blog. You can check them out here. Nothing much exciting going on here. We decorated some this Halloween. Ryan is so excited! I got some cute shots of him and am working on a page about his excitement for the season. He's been wearing his black Spiderman costume every day. I hope it makes it to Halloween! Here is my project that I posted at Pink Paislee yesterday. I picked up several of these tins on clearance (I think they were 50 cents!) and can't wait to do something else with them. My MMM Blog day was yesterday. 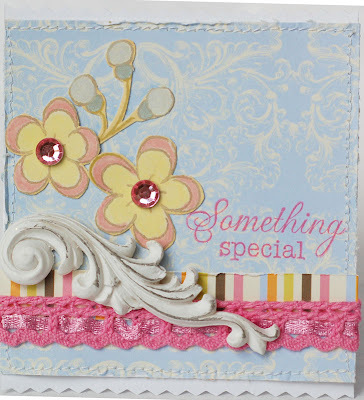 Here's a sneak of the card that I created. You can see the rest of it here. 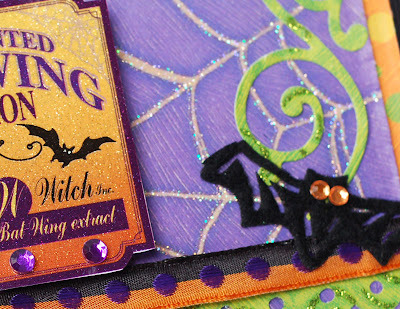 Finally, here's a card that is in this month's Paper Crafts. I layed the Queen and Co. felt onto the paper and spritzed it with Glimmer Mist. The felt acted as a mask. Then I layered the sentiment and more felt over it. That's it for today. Thanks for stopping by! 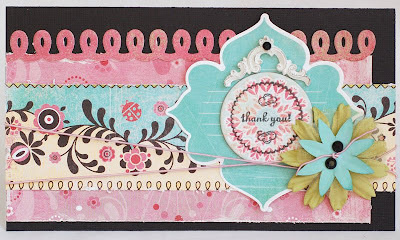 Thanks to everyone who stopped by and played along with the Pink Paislee blog hop on Saturday! 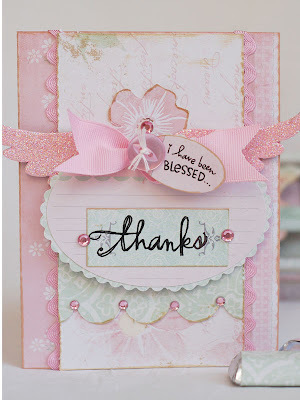 I, for one, totally loved visiting the girls' blogs and seeing all of those amazing cards! Such a soft and pretty card! thanks for sharing it with us! Melinda, email me your address and I'll get the goods out to you! 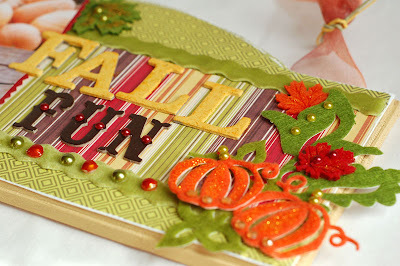 There are some gorgeous creations on the blog, definitely check it out. Here is the card I contributed. The nice thing about doing this was that all of the cards are being donated to charity. 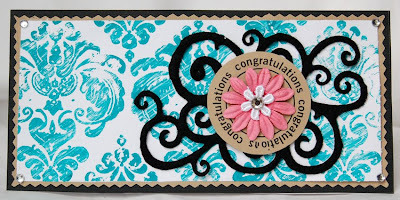 I used a Heidi Swapp damask stamp and created the background using paint. With all of the craziness that's going on in the world around us, it's fun to have something to celebrate. And what could be better than to celebrate something I LOVE to do? Making Cards! 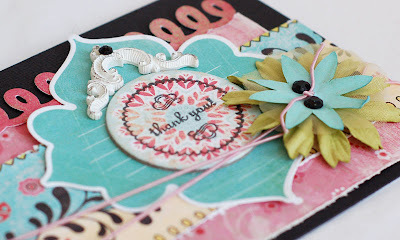 In honor of World Cardmaking Day, we are having a blog hop at Pink Paislee. Check out the PP Blog for links to all of the team members' blogs. 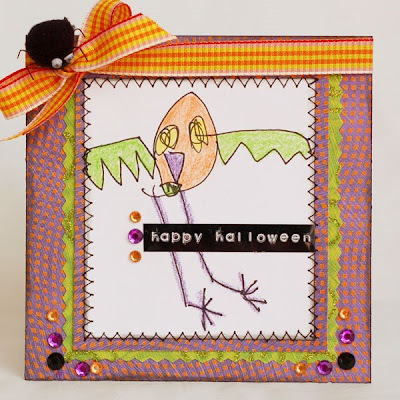 Each blog has a card that was created just for today and there will be directions telling how to make them. 1. Cut a piece of Pop Fashion Leg Warmers paper to 4 by 5.25". 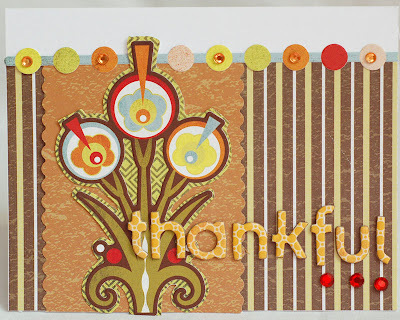 Adhere to white cardstock and trim with decorative scissors. 2. Punch a piece of white paper using the Threaded Water punch. Adhere along bottom of card. 3. Trim a piece of scalloped edge paper from Pop Fashion Jellies paper. Layer this on top of the white border. 4. 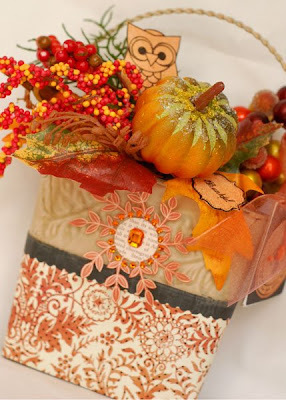 Cover a piece of Autumn Leaves chipboard with light blue cardstock. Add leaf rubon and swirl felt. 5. Wrap trim around card front and tie a bow at the top. 6. 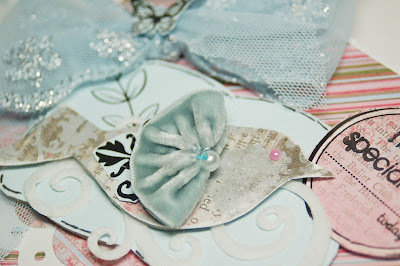 Cover Maya Road bird chipboard with Pop Fashion Hip Huggers paper. Add a pearl for the eye, and velvet flower for the wind. Apply rubon to cardstock and tuck behind flower. Adhere bird to chipboard panel. Trace edge with black marker. Layer this over the trim. 7. 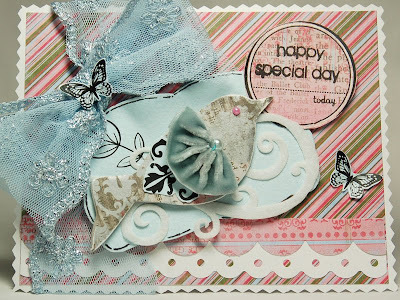 Stamp butterflies onto cardstock. 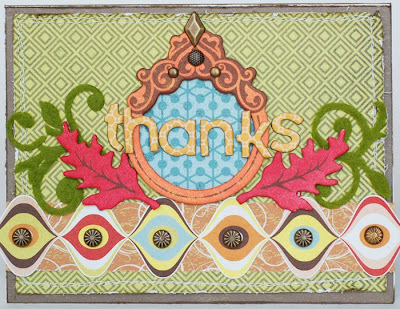 Cut out and adhere to card front. 8. Stamp circle stamp onto Jellies paper. Cut out. Add white border with a pen. 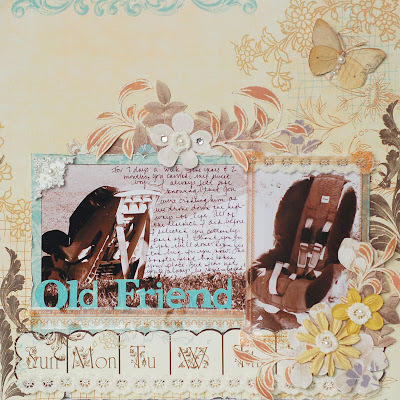 Stamp sentiment onto center. Adhere to chipboard. 9. Adhere card front to a premade card. Thanks for stopping by today. Hope you're able to get some fun cards made. Oh, and if you leave a comment, you'll be entered into an RAK drawing for this little prize package. Over at Emma's our projects this week are all made from small kraft boxes. I have to admit, I was in a bit of a creative rut thinking about what I could do with them. Then, finally, it hit me. I love the kraft color, and I didn't want to cover them up. So, I used rubons to decorate them. 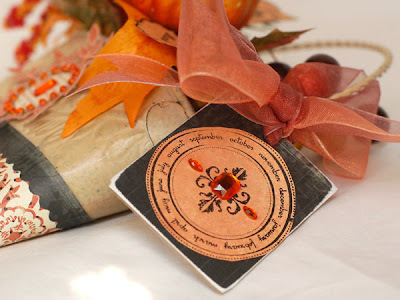 I think they turned out really cool and would be a fun way to package a gift for someone. I used a combination of Hambly, Prima and Daisy Ds rubons on these. 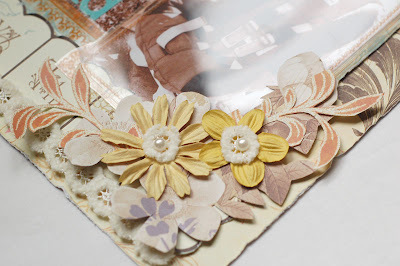 I also used some Prima chipboard on the one box. Kaisercraft jewels added a bit of bling to finish them up. 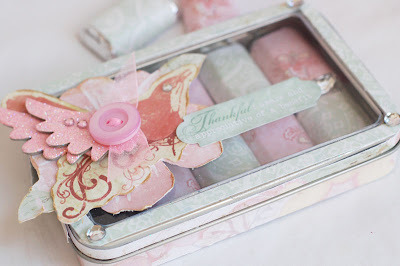 You can see the other amazing Kraft Box creations here at the Emma's Blog. I think this is my favorite batch of projects the girls have come up with so far! Be sure to check out the Pink Paislee blog on Saturday. 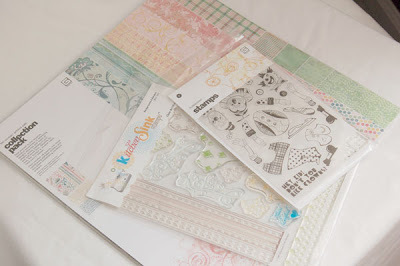 We will be celebrating World Cardmaking Day. Each team member has created a card just for this special ocassion. 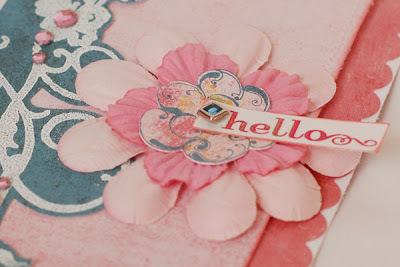 Sneak peeks and links will be provided on the Pink Paislee blog so you can 'blog hop' with ease.